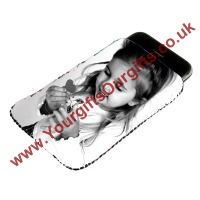 Your photo or design on a soft mobile phone pouch | case, protect and personalise your mobile phone, iPod, mp3 player or any other mobile device with your very own photo on our photo phone pouch. Sized at 85mm wide by 130mm deep and made of a soft and stretchable neoprene cushion material and will fit most phones inc. Iphone, Blackberry, Samsung, Nokia etc, your photo will be heat dyed onto the whole of the front cover. Why not personalised with that photo of the children, loved one, pets, holiday photo etc..we can even turn your coloured photo into black & white if required, just leave any special requests when uploading your photos below.